Of course, the answer is never that simple. Just because a child has a diagnosis of a social communication disorder, word-finding deficits, or a reading disability does not automatically indicate to the treating clinician, which ‘cookie cutter’ materials and programs are best suited for the child in question. Only a profile of strengths and needs based on a comprehensive language and literacy testing can address this in an adequate and targeted manner. To illustrate, reading intervention is a much debated and controversial topic nowadays. Everywhere you turn there’s a barrage of advice for clinicians and parents regarding which program/approach to use. Barton, Wilson, OG… the well-intentioned advice just keeps on coming. The problem is that without knowing the child’s specific deficit areas, the application of the above approaches is quite frankly … pointless. There could be endless variations of how deficits manifest in poor readers. Is it aspects of phonological awareness, phonics, morphology, etc. What combination of deficits is preventing the child from becoming a good reader? Let’s a take a look at an example, below. It’s the CTOPP-2 results of a 7-6-year-old female with a documented history of extensive reading difficulties and a significant family history of reading disabilities in the family. However, the results of her CTOPP-2 testing clearly indicate that phonological awareness, despite two areas of mild weaknesses, is not really a significant problem for this child. So let’s look at the student’s reading fluency results. So now we know that despite quite decent phonological awareness abilities, this student presents with quite poor sound-letter correspondence skills and will definitely benefit from explicit phonics instruction addressing the above deficit areas. But that is only the beginning! By looking at the analysis of specific misreadings we next need to determine what other literacy areas need to be addressed. For the sake of brevity, I can specify that further analysis of this child reading abilities revealed that reading comprehension, orthographic knowledge, as well as morphological awareness were definitely areas that also required targeted remediation. The assessment also revealed that the child presented with poor spelling and writing abilities, which also needed to be addressed in the context of therapy. Now, what if I also told you that this child had already been receiving private, Orton-Gillingham reading instruction for a period of 2 years, 1x per week, at the time the above assessment took place? Would you change your mind about the program in question? Well, the answer is again not so simple! OG is a fine program, but as you can see from the above example it has definite limitations and is not an exclusive fit for this child, or for any child for that matter. Furthermore, a solidly-trained in literacy clinician DOES NOT need to rely on just one program to address literacy deficits. They simply need solid knowledge of typical and atypical language and literacy development/milestones and know how to create a targeted treatment hierarchy in order to deliver effective intervention services. 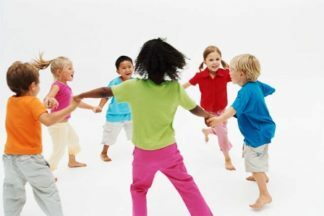 But for that, they need to first, thoughtfully, construct assessment-based treatment goals by carefully taking into the consideration the child’s strengths and needs. So let’s stop asking which approach/program we should use and start asking about the child’s profile of strengths and needs in order to create accurate language and literacy goals based on solid evidence and scientifically-guided treatment practices. Hasbrouck, J. & Tindal, G. A. (2006). Oral reading fluency norms: A valuable assessment tool for reading teachers. The Reading Teacher. 59(7), 636-644. 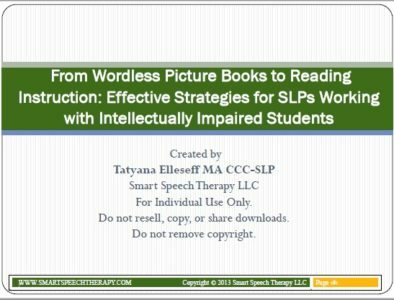 Tolman, C (2005) Working Smarter, Not Harder: What Teachers of Reading Need to Know and Be Able to Teach IDA Perspectives pp. 15-23. 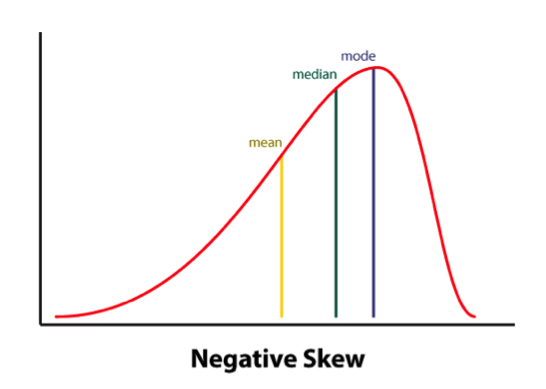 Recently I began writing a series of posts on the topic of comprehensive assessment of dyslexia. In part I of my post (HERE), I discussed common dyslexia myths as well as general language testing as a starting point in the dyslexia testing battery. In part II (HERE) I detailed the next two steps in dyslexia assessment: phonological awareness and word fluency testing. 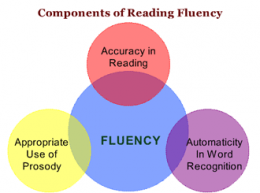 In part III (HERE) I discussed reading fluency and reading comprehension testing. Today I would like to discuss part IV of comprehensive dyslexia assessment, which involves spelling and writing testing. Phonological Awareness – segmenting, sequencing, identifying and discriminating sounds in words. By administering and analyzing spelling test results or spelling samples and quizzes, we can determine where students’ deficits lie, and design appropriate interventions to improve knowledge and skills in the affected areas. While there are a number of spelling assessments currently available on the market I personally prefer that the Test of Written Spelling – 5 (TWS-5) (Larsen, Hammill & Moats, 2013). The TWS-5 can be administered to students 6-18 years of age in about 20 minutes in either individual or group settings. It has two forms, each containing 50 spelling words drawn from eight basal spelling series and graded word lists. You can use the results in several ways: to identify students with significant spelling deficits or to determine progress in spelling as a result of RTI interventions. Mechanics – is there appropriate use of punctuation, capitalization, abbreviations, etc.? Grammatical and syntactic complexity – are there word/sentence level errors/omissions? How is the student’s sentence structure? Productivity – can the student generate enough paragraphs, sentences, etc. or? Cohesion and coherence- Is the writing sample organized? Does it flow smoothly? Does it make sense? Are the topic shifts marked by appropriate transitional words? Analysis – can the student edit and revise his writing appropriately? Again it’s important to note that much like the assessments of reading comprehension there are no specific tests which can assess this area adequately and comprehensively. Here, a combination of standardized tests, informal assessment tasks as well as analysis of the students’ written classroom output is recommended. 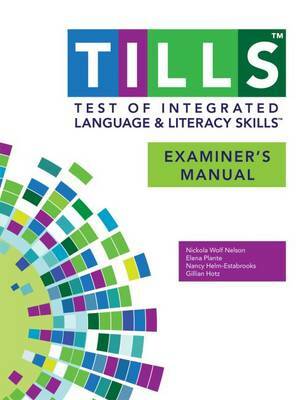 For standardized assessment purposes clinicians can select Test of Early Written Language–Third Edition (TEWL–3) or Test of Written Language — Fourth Edition (TOWL-4). Basic Writing. This subtest consists of 70 items ordered by difficulty, which are scored as 0, 1, or 2. It measures a child’s understanding of language including their metalinguistic knowledge, directionality, organizational structure, awareness of letter features, spelling, capitalization, punctuation, proofing, sentence combining, and logical sentences. It can be administered independently or in conjunction with the Contextual Writing subtest. Contextual Writing. This subtest consists of 20 items that are scored 0 to 3. Two sets of pictures are provided, one for younger children (ages 5-0 through 6-11) and one for older children (ages 7-0 through 11-11). This subtest measures a child’s ability to construct a story given a picture prompt. It measures story format, cohesion, thematic maturity, ideation, and story structure. 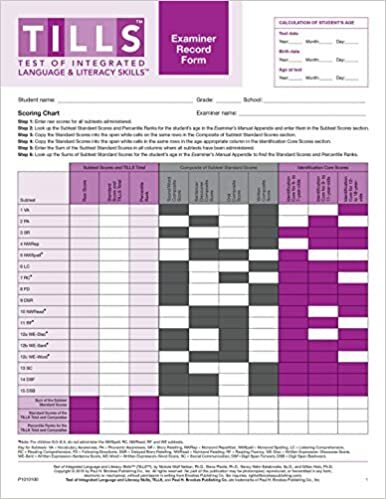 It can be administered independently or in conjunction with the Basic Writing subtest. Overall Writing. This index combines the scores from the Basic Writing and Contextual Writing subtests. 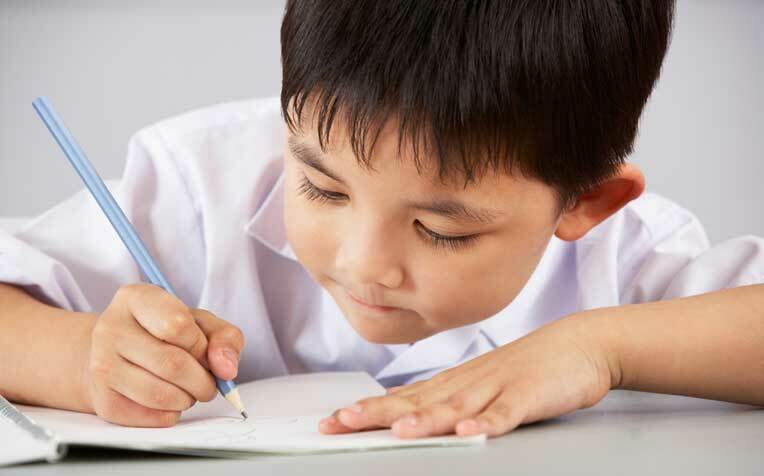 It is a measure of the child’s overall writing ability; students who score high on this quotient demonstrate strengths in composition, syntax, mechanics, fluency, cohesion, and the text structure of written language. This score can only be computed if the child completes both subtests and is at least 5 years of age. 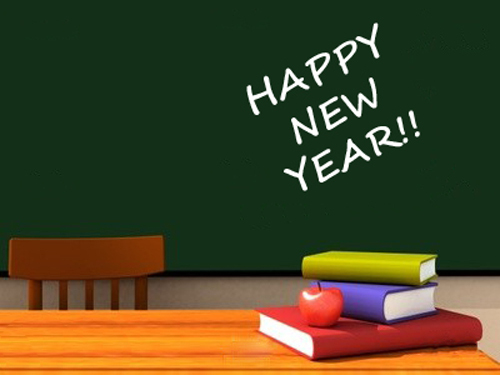 Spelling – The student writes sentences from dictation, making proper use of spelling rules. Punctuation – The student writes sentences from dictation, making proper use of punctuation and capitalization rules. Contextual Conventions – The student writes a story in response to a stimulus picture. Points are earned for satisfying specific arbitrary requirements relative to orthographic (E.g. : punctuation, spelling) and grammatic conventions (E.g. : sentence construction, noun-verb agreement). Story Composition – The student’s story is evaluated relative to the quality of its composition (E.g. : vocabulary, plot, prose, development of characters, and interest to the reader). 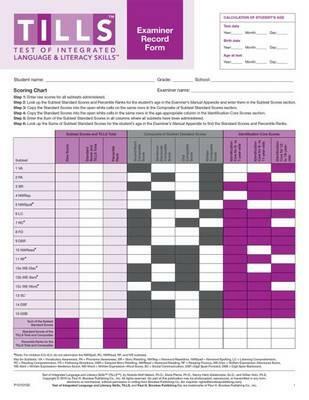 However, for the purposes of the comprehensive assessment only select portions of the above tests may need be administered since other overlapping areas (e.g., spelling, punctuation, etc.) may have already been assessed by other tests, a analyzed via the review of student’s written classroom assignments or were encompassed by educational testing.